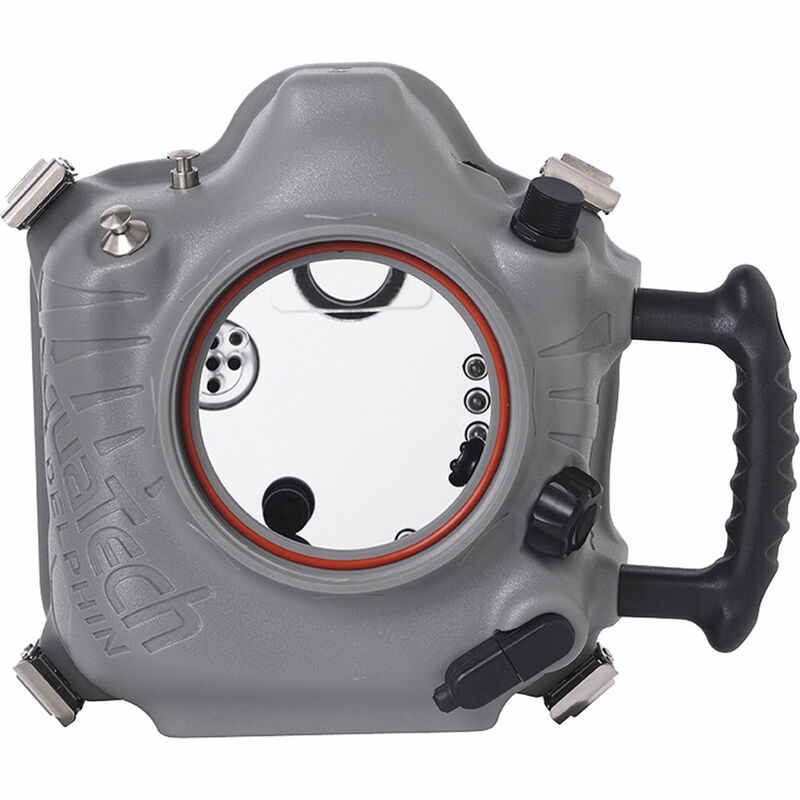 Capture photos and video over, under, or near the water's surface with your Canon 1D X, 1D X Mk II, or 1D C DSLR in this AquaTech Delphin 1D Underwater Sport Housing. Featuring a depth rating of 33', AquaTech housings are designed for shallow water and surface use, and shouldn't be operated at depths beyond 15' for longer than five minutes. The Delphin 1D's tactile, mechanical controls provide easy access to important camera functions, and its ergonomic design and side grip offer optimal handling and comfort. An optional Pistol Grip Trigger and 27" Pole Shutter Extension kit offers remote firing capability and focus control, allowing you to capture blur-free images with ease. The pole also affords extra reach when shooting at certain angles. An optional flash bulkhead sync connector, supplied with the flash housing, enables the Delphin 1D to work with optional accessories such as external flash units and pocket wizards. A threaded 3/8"-16 mounting point at the bottom of the housing enables connection to an optional tripod or tray. The Delphin 1D sport housing ships without a required lens port, and accepts a series of screw-mounted ports for the Canon lens series. For complete compatibility information, see this Port Chart. 3/8"-16 threaded tripod mounting points. Controls Housing provides access to these camera functions: Menu, Playback, Zoom in, AF-On, Live View, Record start/stop, Set, Q Menu, Back Main dial, AF selection button, * button, Mode, Shutter, Joystick toggle. External Strobe Connector The Delphin 1D can accommodate an optional flash bulkhead, which is included with the purchase of AquaTech's flash housing. Mounting 3/8"-16 threaded tripod mounting point. Box Dimensions (LxWxH) 13.1 x 10.5 x 6.3"
Delphin 1D Underwater Sport Housing for Canon 1D X, 1D X Mk II, or 1D C DSLR is rated 4.0 out of 5 by 1. Rated 4 out of 5 by Bjorn Bauer Photography from Multiple Drawbacks < Your 1D Under Water It is expensive, it is heavy, it is huge, it can't go too deep, it doesn't come with all require components, and you never have full camera functionality. But you do get to take a 1D in the water and under water, and that overcomes all the negatives. As the only waterproof housing B&H offers for a 1D I purchased this for my honeymoon and future professional use. It takes a bit of learning and adjustment of technique, but I couldn't be happier with my initial 10 days with the new tool. Make sure you get the correct lens housing for the generation of your lens, and a zoom/focus ring. Re-map custom buttons to get the functionality you want since not all buttons will be available through the housing and not all housing buttons reach the body. Also be aware of the added buoyancy this housing will add to your dive rig. If you want to add underwater flashes be prepared to spend a lot more money.